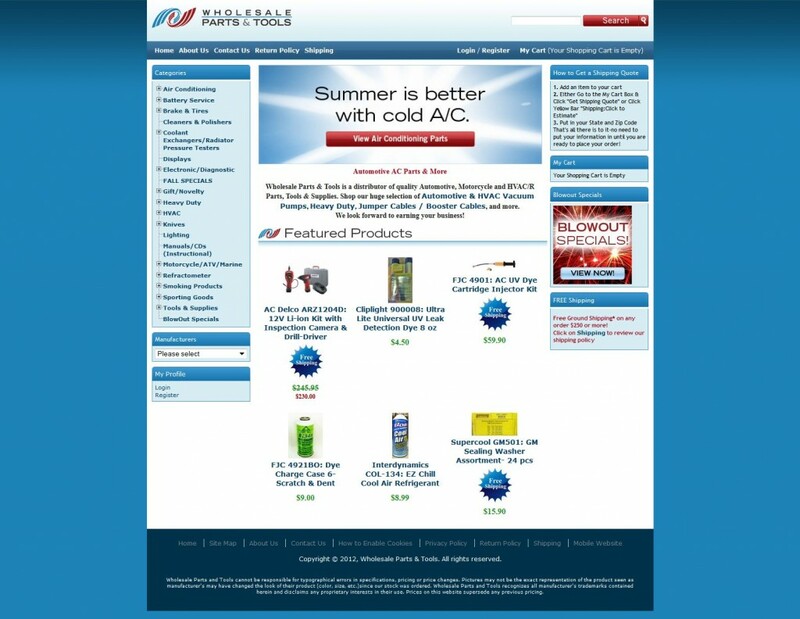 WholesalePartsAndTools.com sells automotive A/C parts and tools. We’ve been working with them since 2008. This year, we upgraded their eCommerce platform and kicked off a new online marketing campaign. Wholesale Parts & Tools came to us in 2008 with an idea, a domain name, and a spreadsheet containing over 1,000 products. In two months, we turned their idea into an online business. Since then, we’ve helped with website updates, new features, and online marketing. We recently upgraded their eCommerce platform to support mobile shopping. We also kicked off an online marketing campaign that includes SEO and paid search. Wholesale Parts & Tools has become a successful online business. The eCommerce platform offers many built-in SEO and online marketing tools. With Google Adwords and Analytics, we’re able to measure the increase in targeted traffic and conversions. In addition, WP&T’s staff can easily manage products, categories, orders, and promotions from the shopping cart’s admin panel.